Naples, Florida—The average sold price for homes and condos rose over $44,000 in September of 2010 as compared to August of this same year. After a steep drop in the statistical average sales prices from July to August, September’s numbers show a trend to the upside, possibly indicating rising prices in months to come. Looking at the bar graph to the right from Sunshine MLS, July 2010 appears to be an aberration created by that $18.5 million sale in Port Royal. The average sale price should have been more around $400 in July instead of the reported $524,734. Only time will tell, but average sales prices should rise back up to the $400 level and above during the coming season (January 2011 through Easter). Keep in mind these statistics are taking into account all the very low-end foreclosures and a even a one-car garage that sold for $9,500 in Positano Place. 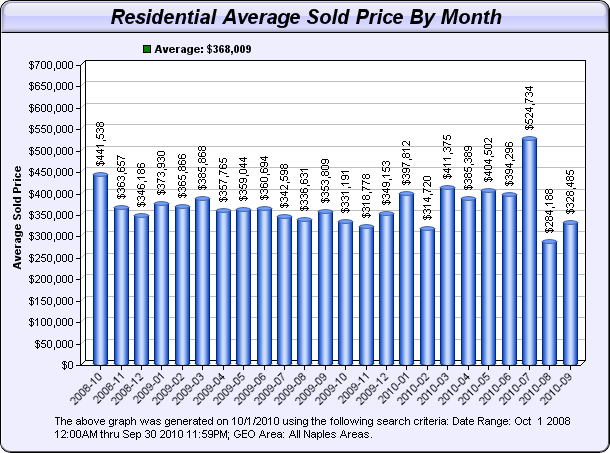 So you may ask, “what can I get for the average price of around $328,485? Below are eight photos of homes currently for sale at approximately this average sales price. Click on each one to see more pictures and details.